As a tooth replacement option, dental bridges may require careful explanation. Our Dental Bridges video plainly explains to patients the benefits of dental bridges and the steps for placement. Missing teeth can negatively impact self confidence, bone structure, and surrounding teeth. It’s important that your patients know the consequences of missing teeth and have the information needed to decide on dental bridges as a solution. Dental bridges are an important procedure for those who qualify. They offer restructuring benefits, a restored smile, and ultimately, an improved quality of life. In just over two minutes, your patients will know the types of bridges, likely materials, and the ins and outs of dental bridges. Not only will they see the process up front, but they’ll get an understanding of how to properly care for their new bridge once it has been placed. Each Toothflix video you purchase is instantly accessible through your online ADA e-bookshelf . To learn more about the Toothflix video series, visit ADA.org/toothflix. 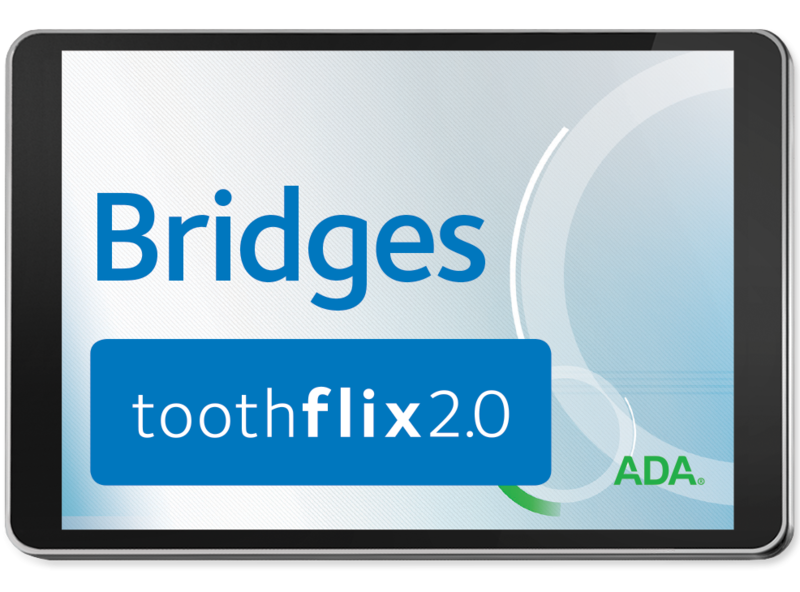 Order your Dental Bridges – Toothflix® 2.0 Streaming Video today!